Integrated, multidisciplinary, inter-cultural curriculum resources for elementary classrooms are being developed by the education committee of the Bras d’Or Lake Biosphere Reserve Association (BLBRA). It is an exciting time in the Nova Scotian school system as educators struggle to ‘indigenize’ their curriculum. In the BLBR we are in a good position to contribute to these efforts because of our place-based learning about Mother Earth using the guiding principle of Two-Eyed Seeing. Experiential, cross-cultural curriculum resources have been developed by the education committee of the BLBR and adopted by the Mi’kmaw school board (Mi’kmaw Kina’matnewey) and the provincial department of education. The estuary unit examines the concepts of density and buoyancy and the students learn about the adaptations that allow the unusual plankton to control their density and stay in the water masses that they are physiologically adapted to. So, relict arctic species that invaded the estuary thousands of years ago when Mi’kmaw ancestors lived in a much colder climate now can maintain position in isolated, cold pockets in the depths of the Bras d’Or estuary. The present reflects the distant past. 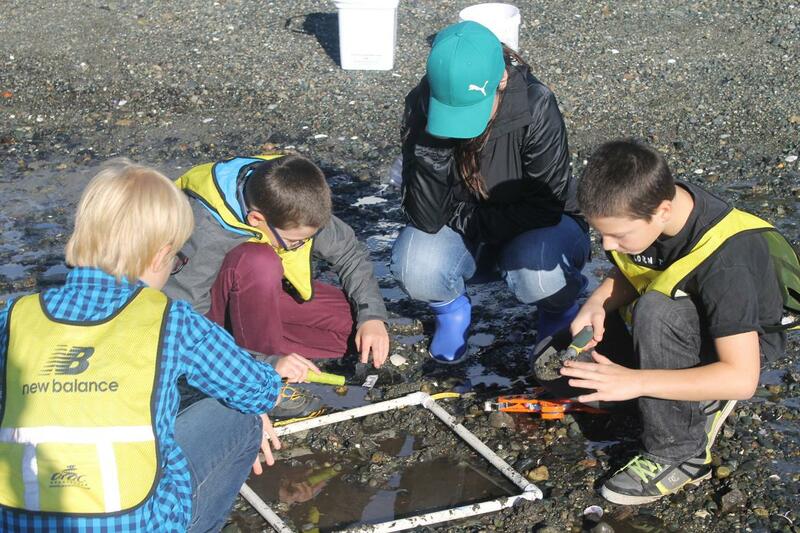 Another unit based on the medicine wheel is aimed at an examination of habitat requirements of resident animals such as crabs in the estuary and frogs in forest ponds. When a habitat is in balance, as demonstrated using a medicine wheel, all of the animal’s requirements are met. A large resource based on the unique Geology of the Biosphere is currently being revised. These place-based multidisciplinary science-based units tie students to Mi’kmaw philosophy, help them understand large natural cycles and encourage inter-generational dialogue based on stories rooted in a cultural memory of place. Elder Albert Marshall has advised that it is time that Mi’kmaw science is reflected in school curriculum. The BLBR is an ideal place to develop those curriculum pieces in that common ground.